When faced with opposition while doing the will of God -- Stand! The way to stand strong in the face of opposition is to trust the unction within. After the death of Moses, Joshua became the leader of Israel. While they were on the bank of the Jordan River, God instructed Joshua to 1) arise 2) go over Jordan into the Land of Promise. Then God told Joshua do not fear what he had been commanded because no man would be able to successfully oppose him all the days of his life. (Joshua 1:1-4) The assurance of this was in God’s promise, “As I was with Moses, so shall I be with you.” Joshua 1:5 Within this promise was the understanding of how to stand in the face of opposition. By remembering what opposition Moses had faced and how God responded to it, Joshua understood what type of opposition to expect and how to stand in the face of it. This is also true of Christians. God’s promise to Joshua is also a promise to Abraham’s children by faith – Christians. (Galatians 3:14,26-29) By understanding the type of opposition Moses faced and how God delivered him, Christians can understand what type of opposition they may face as they do God’s will and how to stand in the midst of it. While leading the children of Israel, Moses faced opposition from three sources: 1) Pharaoh (Exodus 3:19) 2) Miriam and Aaron (Numbers 12:1-16) 3) Korah, Dathan and Abiram (Numbers 16:1-40). In each case of opposition, God delivered Moses. Moses was then able to continue to do what God had anointed him to do. Miriam spoke against Moses because of his Ethiopian wife. Moses’ personal life was none of Miriam’s business. He had done nothing wrong – and even if he had, it was not Miriam’s place to correct him. It was God’s. (Exodus 4:24-26) Because of her opposition, God allowed Miriam to become leprous. After Aaron cried to Moses, Moses prayed for her. God healed her only after Moses prayed for her. However, god also expressed His displeasure with what she had done by comparing His judgment to a father spitting in her face! (Numbers 12:14-1) God does not like ugly! Opposition to what the anointing teaches is not opposition to man, but to God. This is the spirit of antichrist. This is not THE Antichrist who will be made known during the Great Tribulation, but one of many erroneous spirits in the world today. (1 John 2:18) The spirit of antichrist refuses to acknowledge the presence of the Holy Ghost in a Christian’s life. It is a lying spirit of the world. The Holy Ghost dwelling within Christians is greater than the lying spirit of the world. (1 John 4:1-6) Therefore, when faced with such opposition, Christians are to listen to the anointing within. From Moses’ experiences, we Christians learn opposition can come in three ways: 1) opposition to the plan and purpose of God 2) the nosiness of busybodies 3) rebellion against the anointing God has placed on our lives. However, regardless of the nature of the opposition, IT WILL NOT STAND. We Christians have the assurance that GOD IS WITH US as we do His will. 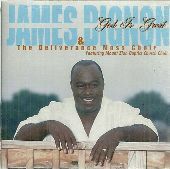 Click here to hear the song God is Great by James Bignon. Time to Act on Your Faith!